If you hate your crooked or discolored teeth, you don’t have to live with it. Don’t let a smile you hate get in your way. At Chicago Veneers, we offer a variety of veneers to give you the straight, white smile that you’ve always wanted. One of your options is snap-on smiles, or sometimes called clip-on or press-on veneers. This alternative to traditional veneers simply clips on over your teeth to instantly give you a beautiful, radiant smile. Snap-on smiles are not typically intended for all-day and everyday wear. Instead, most people who opt for press-on veneers generally only wear them for work or events. Whatever you want Snap-On Smiles for, they’re sure to give you the confidence boost you need to look good and feel good! How Are Snap-On Smiles Placed? After you and your dentist decide that snap-on smiles is the right choice for you, they will be custom made for you, and your dentist will whiten your teeth. 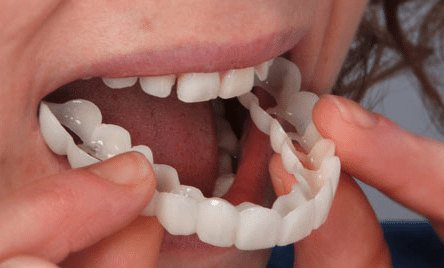 Your dentist will take a model of your teeth and send it off to the lab. Because they are made using a cast of your teeth, they should not be uncomfortable or cause you pain. 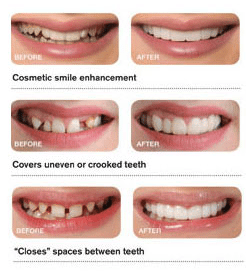 If you want to know more about how snap-on smiles can give you a smile you’ll want to show off, call our office today at at (312) 435-0411 or request online for your appointment.